New sock. I love this yarn, which is Shibui sock in Ginger, and I’ve been feeling inspired by the (multiple pairs of) socks Lisa recently posted over at Knithound Brooklyn. 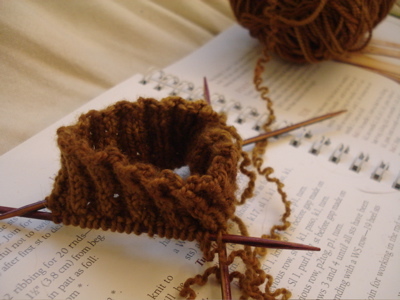 This ribbed cuff is going to grow into a Gentleman’s Fancy Sock, from Knitting Vintage Socks by Nancy Bush, with a few changes. 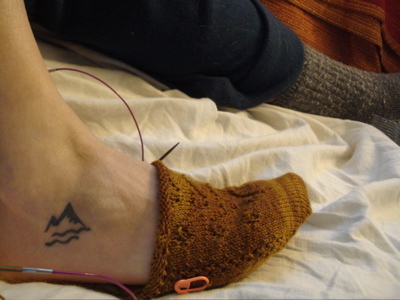 Because these are definitely for me, and I want them to fit, I went down a needle size to 2.5 mm needles, and cast on 64 st instead of 80 to adjust the pattern both for my yarn and for my foot. Because I have less yarn that is called for, my pair will have to be a standard length, so I’m foregoing the (lovely) leg shaping included in the pattern. No hurry on this pair — there are lots of other projects in my WIP pile that I’d like to finish up. It simply seemed ridiculous to not cast on for another pair of socks after frogging the old ones, and these will likely live in my bag and do their part to keep me company throughout the coming semester, which starts Monday. 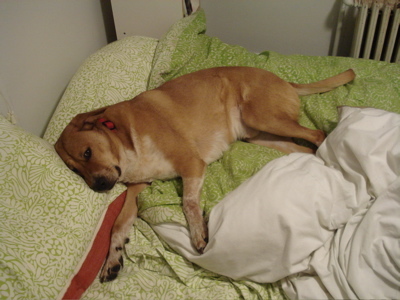 Speaking of which, somebody (ahem) around here needs to be better about getting out of bed in the morning. While this guy normally stretches, sighs, and stumbles out of bed mere moments after I wake up, today he wanted nothing more than to lay his head back down on the pillow and doze while I made the coffee, fetched breakfast, and the like. Life is so hard for Boh. Finally, it seems it wouldn’t be a complete blog post over here at chez Rooster without a picture of a delicious dinner prepared from Heidi Swanson’s Super Natural Cooking. 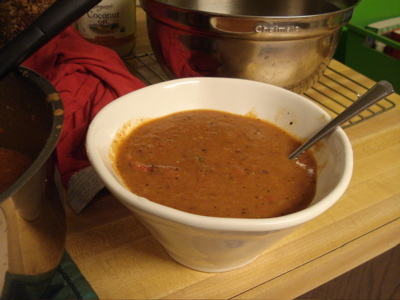 This is her Roasted Tomato and Paprika Soup, made with homemade stock based on her veggie stock recipe. This is the second time I’ve made this soup this month, and I’ll be making it again. (I’m also newly addicted to smoked paprika, and I blame this book.) Also, today over on 101 cookbooks, Heidi posted that she’s working on another cookbook! I’m glad to hear it, as this is one of my current favorites. Off to bed — Boh is already there, of course.